I found Animal Mix on pureformulas.com while ordering another product and works great for allergies to cat hair and dander. Animal Mix by Professional Formulas is an ideal formula for people who suffer from hypersensitivity due to animal residues. Each drop of Animal Mix has Adrenals which can support the body’s response to stress and irritation from different sources. Adrenals secrete steroid hormones such as Cortisol. ACTH (adrenocorticotropic hormone) could stimulate the adrenal gland to release Adrenaline and Cortisol. These hormones potentially aid the body’s response to stress. They may also protect the immune system. Histamine is produced by the body and causes vasodilation. Vasodilation is a process that allows white blood cells to move freely to the site of an infection. Histamine possibly helps to relieve swelling caused by infection. Animal Mix contains a blend of animal particles that combat sensitivity and allergy. 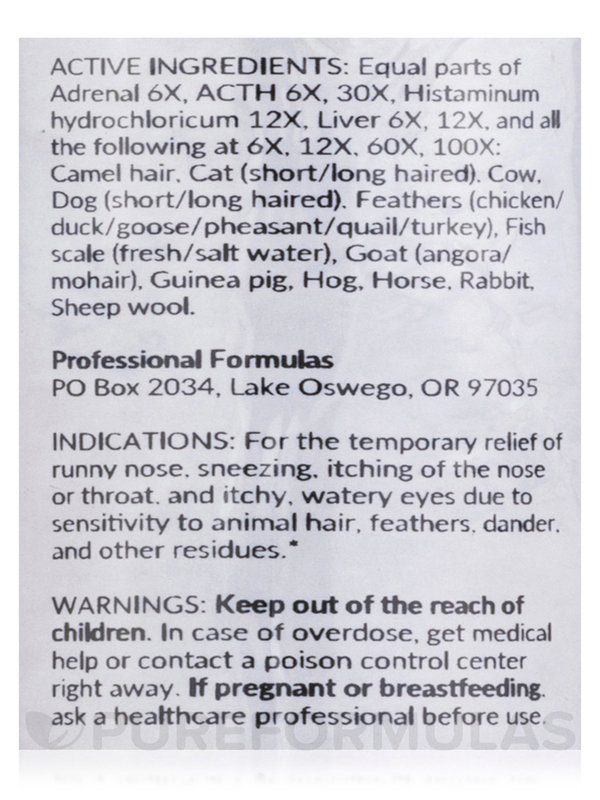 Active Ingredients: Equal parts of Adrenal 6X‚ ACTH 6X‚ 30X‚ Histaminum hydrochloricum 12X‚ Liver 6X‚ 12X‚ and all the following at 6X‚ 12X‚ 60X‚ 100X: Camel hair‚ Cat (short/long haired)‚ Cow‚ Dog (short/long haired)‚ feathers (chicken/duck/goose/pheasant/quail/turkey)‚ Fish scale (fresh/salt water)‚ Goat (angora/mohair)‚ Guinea pig‚ Hog‚ Horse‚ Rabbit‚ Sheep wool. Place drops under tongue 30 minutes before/after meals. 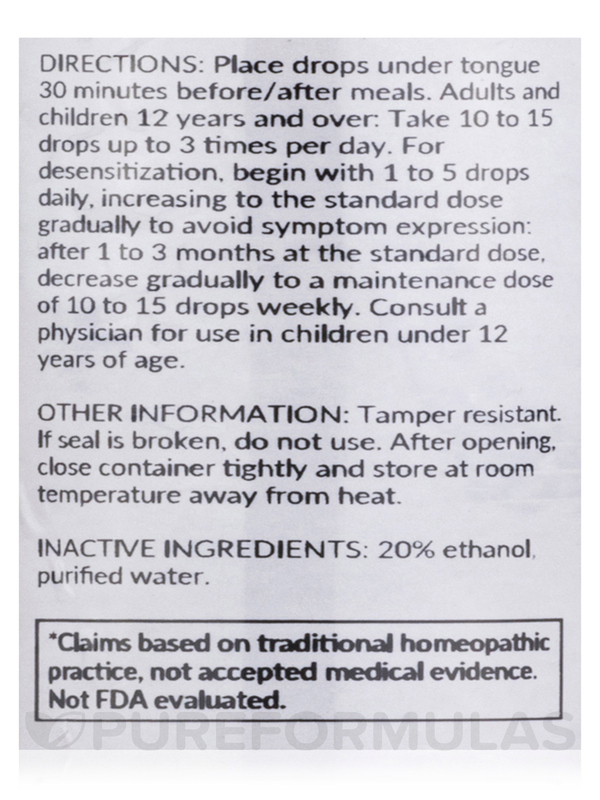 Adults and children 12 years and over: Take 10 to 15 drops up to 3 times per day. 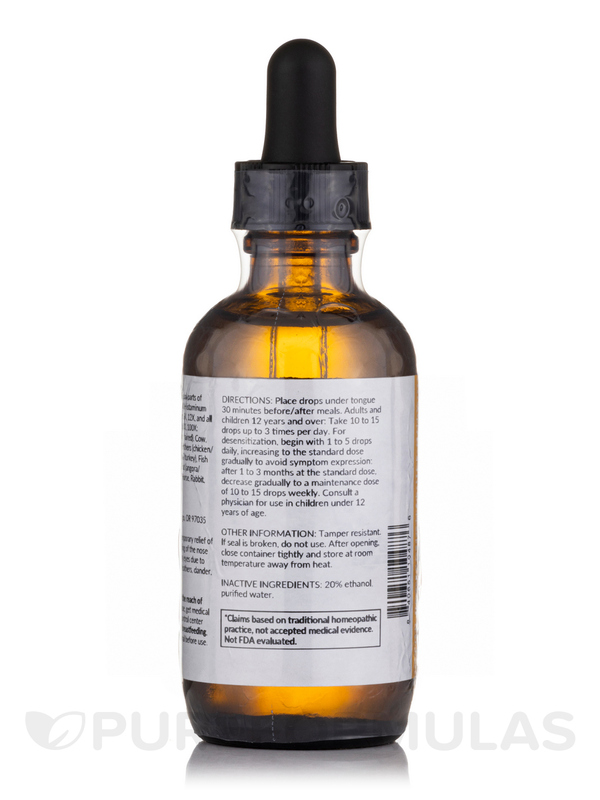 For desensitization‚ begin with 1 to 5 drops daily‚ increasing to the standard dose gradually to avoid symptom expression; after 1 to 3 months at the standard dose‚ decrease gradually to a maintenance dose of 10 to 15 drops weekly. Consult physician for use in children under 12 years of age. After opening close container tightly and store at room temperature away from heat. My nephew was very allergic to all dogs, and would break out in a red rash on his skin as well as getting stuffed up whenever he was in contact with a dog. I ordered Animal Mix by Professional Formulas for him when we got a puppy, and after finishing a bottle of it taken as directed (on the label), he has no remaining allergic reaction to our dog unless he rubs his face into the dog's fur. Then, he has a very mild reaction. So basically, one bottle of this has relieved my nephew of his dog allergy and he's able to play with dogs, and just knows not to rub his face into the dog. It's been fantastic. Effectiveness, price, and ease of use. 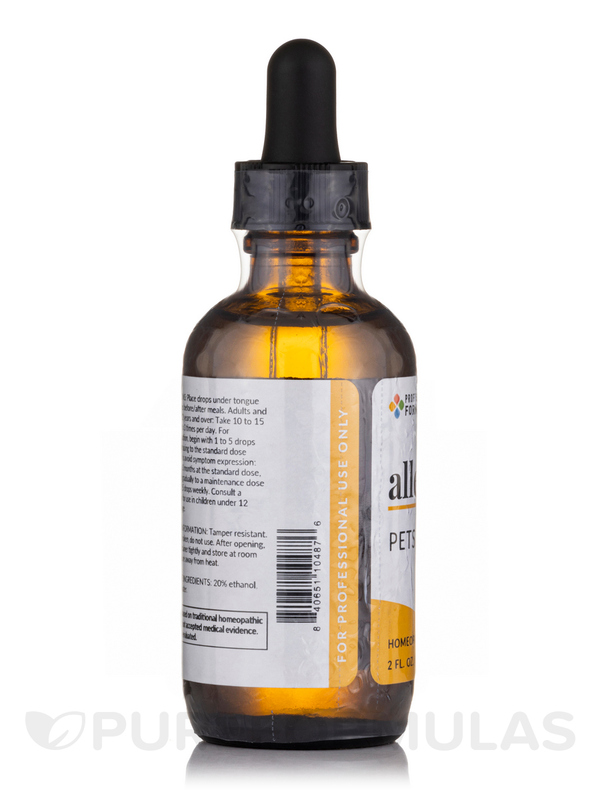 I am a physician and utilize Animal Mix 2 for all my patients that have pet allergies. I can snuggle with my kitty again! Ive used Animal Mix before years ago - and it worked within 3 days I continued taking the drops for a month as directed and have been able to snuggle with my cat without any allergic irritation. Animal Mix has lasted literally years and only recently after a major loss in my family have I been bothered by my pet dander allergy. After taking the drops for two days I am again able to snuggle without ill effects from my kitty cat. Great Formula thank you! J. B. Helps within a short period of time. Symptoms of runny nose sneezing watery eyes clear within days of use. Cannot think of anything I dislike about it. I like the fact I can take 10 drops in the morning once a day and feel better.